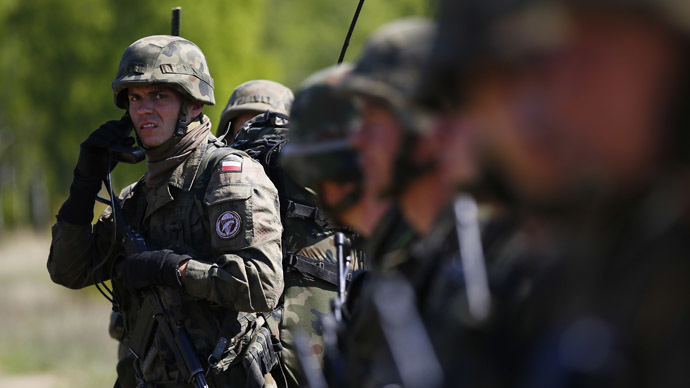 Poland has been a staunch ally of Ukrainian President Petro Poroshenko and Warsaw says the number of military advisers will range from around a dozen to several dozens. "The defense ministry intends to send Polish instructors to support the training of Ukrainian non-commissioned officers," Defense Ministry adviser Boguslaw Pacek told Reuters. The move comes in the wake of a decision by British Prime Minister David Cameron to send military advisers to Ukraine, a move which was praised by Polish President Bronislaw Komorowski, who said “playing the right tune on Ukraine” with his decision to send military personnel to the war-torn country, which was reported by the Polish press agency. However, Cameron has ruled out sending lethal aid to Kiev, as had been requested by President Poroshenko in the lead-up to the recent talks in Minsk, which looked to try and bring an end the conflict. Cameron said the support provided by the UK would be given “well away from the area of conflict,” adding that the purpose of aid would be to improve Ukraine’s tactical advantage. Meanwhile, his Secretary of State for Defense, Michael Fallon, said sending troops to Ukraine would not mean they would take a role in any potential conflict that may arise. "We are not deploying combat troops to Ukraine and will not do so," Defense Minister Fallon said, when asked whether the deployment of military personnel would provoke so-called mission creep, according to Reuters. Mission creep is a military term used to describe a gradual shift in objectives during the course of a campaign, often resulting in an unplanned long-term commitment. US President Barack Obama is still mulling over an idea to send lethal weapons to Ukraine. Washington has been an ardent supporter of the regime in Kiev, which took power after an armed coup in February 2014. It lays the blame squarely on Russia for the country’s slide into a civil war, which has already claimed more than 5,600 lives. However, a senior adviser to the US president believes sending lethal aid to Ukraine would not solve the problems in the country. Despite failing to provide any convincing proof, the US and EU blame Russia for masterminding the Ukrainian conflict and supporting the rebels fighting the Kiev government in the southeast of the country – claims repeatedly denied by Moscow. Russia has also said on numerous occasions that sanctions as a means to resolve the crisis in Ukraine are pointless, as Russia is already doing all it can in that respect. However, the head of the self-proclaimed Donetsk People’s Republic, Aleksandr Zakharchenko, says that the US has already been arming the Ukrainian armed forces. He told reporters on Monday that the US is already supplying Kiev with ammunition and weapons on a “large-scale basis,” noting that pro-government forces are not looking for peace. Russia’s President Vladimir Putin has been a strong advocate of sticking to the Minsk agreement, which would see prisoner exchanges, a demilitarized zone put in place and the withdrawal of heavy weaponry. The Foreign Ministers of France, Germany, Russia and Ukraine met in Paris on Tuesday to discuss the peace plan implemented following the Minsk 2 agreement was agreed upon by the four countries’ leaders on February 12. “The situation has significantly improved, that was acknowledged by my partners,” Russian Foreign Minister Sergey Lavrov said. “However, sporadic violations are being registered by the OSCE observers,” he said. Meanwhile, Kiev has refused to start the pullback, blaming the rebels for ceasefire violations. And Ukrainian military spokesman Andrey Lysenko said that two days of ceasefire are necessary for Kiev's troops to start the withdrawal of heavy weapons. The issue that Kiev is not withdrawing weaponry from the demarcation line in Donbass is a matter of concern for the OSCE whose mission in the country is tasked with monitoring the heavy weapons pullback. “Ukrainian military forces keep silent for the moment being. They don’t pull out their heavy weaponry and say that a pause is needed. That is what really triggers certain concern of the OSCE as this pause may last indefinitely,” the Russian Ambassador to the organization, Andrey Kelin, said, as cited by RIA Novosti. The rebels say they have sent an inventory to the OSCE and that the observers are rejecting invitations to witness the actual movements of the weapons. “Every day they have new conditions to put forward. For instance, [on Thursday] they demanded a concrete route for the artillery. Well, that heavy hardware doesn't travel on the roads, but OSCE monitors wouldn't care to go into the fields,” complained Eduard Basurin, a Donetsk militia spokesman. The official added that the anti-government forces are not rejecting the OSCE's role in tackling the withdrawal and that they want an increased presence of the monitors on the ground. While the diplomats were busy discussing peace in Paris, President Poroshenko was busy discussing a few things of his own – namely buying weapons from the United Arab Emirates. Ukrainian Interior Minister Anton Gerashchenko made the claims on his Facebook page on Tuesday, saying the deal was struck with the Crown Prince of Abu Dhabi and deputy supreme commander of the UAE Armed Forces, Mohammed bin Zayed bin Sultan Al Nahyan. “It’s worth emphasizing that unlike Europeans and Americans, the Arabs aren’t afraid of Putin’s threats of a third world war starting in case of arms and ammunition supplies to Ukraine,” Gerashchenko wrote.